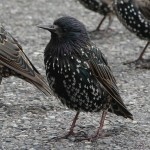 The starling is between 7.5” –8.5” tall and weighs 2 to 3 ounces. It is distinguished by its’ short, squared tail, and its long, slender bill. 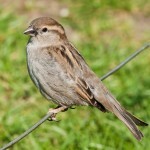 The Sparrow is a slight bird, measuring 5”-6” and weighing approximately 1 oz. They female birds have a plain brownish chest with a dull eye-stripe and the males have black throat and chest patches with light cheeks and brown napes. 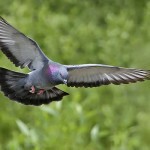 Pigeons are characterized by their dark bluish-grey heads, necks and chests. They have glossy feathers around their wings and necks that are iridescence and range from greenish to reddish-purple in color.